Fun and games at the July 17th Party in the Parks. Image courtesy of the City of Mill Creek. 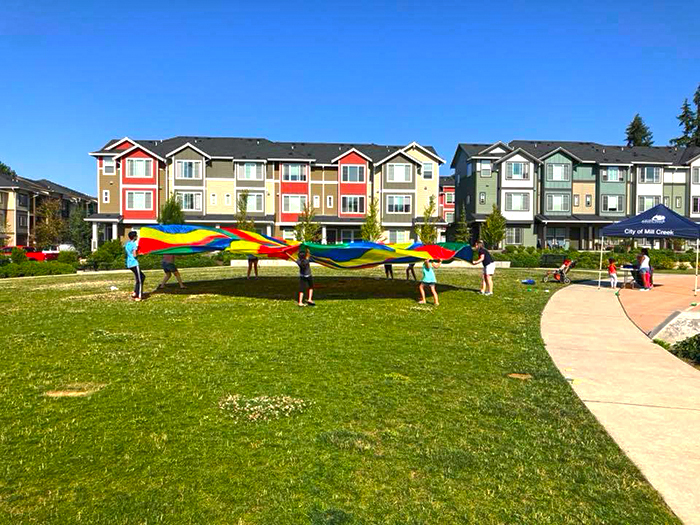 This summer the new City of Mill Creek recreational program called Party in the Parks is replacing the long-standing Summer Children’s Concerts. Each monthly Party in the Parks will be held in rotation at one of the city’s ten neighborhood parks. Kirk explained that each of three 2018 Party in the Parks events will be held from 5:00 to 7:00 pm on the third Tuesday in each month to allow working parents a chance to attend the events. She also noted that the early finishing time takes into account small children’s bedtime. City councilmembers will be able to meet and connect with constituents at these events as council meetings are held on the first, second, and fourth Tuesday of each month. A recent city council long-term planning session identified the need for councilmembers to be more active at community events. The first Party in the Parks was held on July 17th at Buffalo Park. The next one will be held on August 21st at Heron Park and the last one of the year will be at Cougar Park on September 18th.